TheArmenianKitchen.com : I was wrong in thinking a bit of bad news would spoil my appetite for dolma. Really, nothing could! I was wrong in thinking a bit of bad news would spoil my appetite for dolma. Really, nothing could! I’ve been slacking in my consumption of Armenian coffee lately, so I’m moving slowly. That’s the best excuse I have for not writing sooner about Azerbaijan’s claim to victory over Armenia in the quest for international dolma supremacy. Our friend Lucine Kasbarian passed along news a few weeks back that UNESCO, the UN’s cultural arm, had included Azerbaijani dolma on its cultural heritage list. I replied at the time that it's a good thing I didn’t read her email before dinner or I’d have lost my appetite. I’m ready to argue with anyone who thinks dolma isn’t Armenian, although I’ve more often argued with Armenians who have different ideas about dolma. When Mom said she was cooking dolma for dinner, I expected stuffed baby eggplants. Sometimes she’d stuff peppers, too, or zucchini or even cucumbers. Armenians will stuff just about any vegetable fat enough to be hollowed out and small enough to be tucked in a pot and covered in broth. It’s all good, and its even better the next day. The dolma Armenia and Azerbaijan have been tussling over in recent years is the stuffed grape leaf variety, which no one I knew called dolma. It was sarma or yalanchi or yaprakh or . . . well, the list just seems to go on. Don’t bother to tell me that this name is Turkish or that one’s Arabic, or that the Greeks call their version dolmades while the Persians call theirs dolmeh. As I said, it’s all good. So I’m not going to get into a stew about Azerbaijan’s boast but I do think the outcome raises an important point for Armenians to consider before we move on to the next dispute over culinary origins—and make no mistake: there will surely be a next dispute. Simply put, international recognition can be both sweet and sour. After all, Armenians celebrated this same group’s recognition of lavash as an Armenian heritage food just a few years ago. Reading through the cultural heritage list, it’s clear to me that the honors aren’t necessarily based on science. Read the text closely and you’ll see that UNESCO does not conclude that Azeris invented dolma. 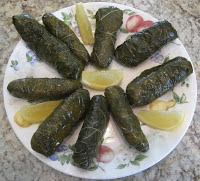 It basically recognizes dolma’s rolling-and-stuffing ritual as a national tradition. Yet that’s also clearly the case within the borders of any country between Iran and Hungary. It’s also important not to get too wrapped up (so to speak) in the varied naming protocols noted above. The folks at UNESCO did just that and wound up taking a wrong turn before cresting the Caucuses. 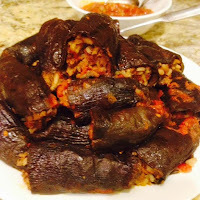 The UNESCO citation states that the word dolma is derived from the "Turkic word" doldurma, meaning stuffed. I don't speak Turkish, so I won't dispute their root. But to accept that explanation you'd have to believe the Azeris and their Turkish cousins came up with a name identical to ours by sheer coincidence before ever encountering an Armenian. In fact, Armenian scholars note that our word tolma (remember that Eastern Armenian transliteraion reverses the "t" and "d" sounds) dates to our Urartuan ancestors, long before the first Turkic nomads arrived in Asia Minor. It is derived from the name for Armenia's wild grape vines, toli. You can read more about this but I'm satisfied that we're right. I'll be even more satisfied by a large bowl of dolma with a portion of lavash for dinner. Doug, also note that, per Wikipedia, classical Armenian pronunciation was close to Eastern Armenian. So we may presume that Mesrop Mashtots ate his tolma with a side of matsoon.